San Francisco, CA, December 16, 2016 —The Office of Economic and Workforce Development (OEWD), the Mayor’s Office of Housing and Community Development, and the San Francisco Arts Commission with key partners today announced grants of over $1 million to support 31 social service, child care and arts nonprofit organizations s as part of the San Francisco Nonprofit Sustainability Initiative. In total, 76 community organizations have received $4.5 million over the past two years in financial awards and real estate services to secure long-term leases and affordable spaces while continuing to provide vital services to residents. • San Francisco Gay Men’s Chorus (SFGMC), which made a pragmatic decision to consolidate space to manage their occupancy costs in this market. Through City assistance, they secured a 5-year lease with a 5-year renewal option at 526 Castro Street and received funding for tenant improvements to the space so that it can best meet their needs. Founded in 1978, SFGMC was the first choral organization to courageously proclaim its orientation in its name and is credited with helping start the LGBT choral movement that now spans the entire globe. Its mission is to create extraordinary musical experiences that inspire community, activism and compassion. • Homeless Youth Alliance, which secured a 5-year lease with a 5-year renewal option and opened a new administrative space on Haight Street. The organization works with approximately 2,000 youth annually, aged 13-29, who live on the streets in the Haight-Ashbury and Castro districts, meeting them where they are at and helping them build healthier lives. • Instituto Familiar de la Raza (IFR), which was nearly displaced from its current space on Mission Street, but was able to come to an agreement on a 5-year lease. Founded in 1978, Instituto Familiar de la Raza works to support the mental and physical health of Chicano/Latino, multicultural/multiracial families, and youth and adults. • The Cultural Conservancy, which successfully renewed its lease at the Thoreau Center in the Presidio for a 5-year term. Its mission is to protect and restore indigenous cultures, empowering them in the direct application of their traditional knowledge and practices on their ancestral land. SAN FRANCISCO, September 28, 2016 –As part of a citywide celebration of the 50th anniversary of the Summer of Love, the San Francisco Arts Commission (SFAC) will offer two opportunities for the public to reflect on this historical event. 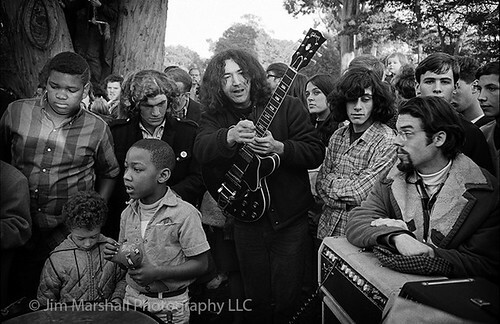 Opening on January 26 at City Hall, Jim Marshall: Summer of Love features 80 works by the iconic photographer taken during his time in San Francisco in the 1960s. Starting in spring 2017, the Arts Commission’s popular Art on Market Street Poster Series will explore the Summer of Love and its cultural impact through contemporary work by local artists Sarah Hotchkiss, Kate Haug and Deborah Aschheim. The popular Art on Market Street Poster Series features new work by local artists on an annual basis shown in the bus kiosks along Market Street between the Embarcadero and 8th Street. With the advent of the 50th anniversary, the Arts Commission invited artists to reexamine the Summer of Love. The selected artists, Sarah Hotchkiss, Kate Haug and Deborah Aschheim will each present very distinct takes on the event. Hotchkiss examines the “diverse Bay Area political, cultural and social scenes of 1967” through local mainstream and underground media published during that period, such as the San Francisco Chronicle, Haight Ashbury Free Press and the Black Panther’s Black Community News Service. Haug’s posters are a series of Sumer of Love trading cards featuring an array of personalities who were influential in the Bay Area during the Summer of Love era, including Timothy Leary, Allen Ginsburg, poet Lenore Kandel, Joan Baez, Jerry Garcia, Janis Joplin, Emory Douglas and others. Aschheim explores the “intersection of political and social utopian ideas that drew people to San Francisco” through detailed pen and ink drawings of protestors, the Diggers and the Black Panther community. The award winning book, The Haight: Love, Rock And Revolution, by Joel Selvin with photography by Jim Marshall is another fantastic resource on the counter culture movement in the San Francisco Bay Area in the 1960s. Opening Reception: Thursday, January 26, 5:30 – 7:30 p.m. Free and open to the public. Chinatown – October 23, 2016, noon – 4 p.m.
WHAT: The San Francisco Arts Commission Galleries (SFAC Galleries) is hosting its signature event, Passport, on Sunday, October 23, 2016. This unique event puts the art collecting experience in the hands of the general public. By bringing local artists into neighborhood venues, Passport attendees can “create” their own limited-edition artist’s book by collecting original, artist-designed stamps in a customized “passport” notebook. Walking throughout Chinatown, hundreds of do-it-yourself art collectors will follow a designated route to collect stamps from hot Bay Area artists while discovering the small businesses that line one of the Mayor’s Invest in Neighborhoods corridors. Seventeen emerging and established artists will participate this year including: Kayan Cheung-Miaw, Richard Colman, Dragon School, Ala Ebtekar, Adam Feibelman, Mik Gaspay, Tanja Geis, Cathy Lu, Terry Luk, Monica Lundy, Mads Lynnerup, Golbanou Moghaddas, Ramekon O’Arwisters, Johanna Poethig, Xiaoxiao Zeng, Julia Goodman and Hung Liu. Artists will stamp passports at a variety of unique businesses and organizations in Chinatown, including: Chinese Cultural Center, Dragon Seed Bridal, Clarion Music Center, I-Hotel/Manilatown Heritage Foundation, Legion, Victor Tung Couture, 41 Ross and many more. The SFAC Galleries worked closely with the Chinatown Community Development Center and Chinese Culture Center to ensure that the entire Chinatown community is engaged in the event. This fall is Passport’s eighth anniversary. SFAC Galleries has been able to support its mission of making contemporary art accessible to broad audiences through this annual event. In the past, Passport has engaged Japantown (2015), The Mission: Calle 24 (2014), the Divisadero Corridor (2013), North Beach (2012), the Castro (2011), Hayes Valley (2010) and The Mission (2009), and worked with over 70 local Bay Area artists including Barry McGee, Clare Rojas, William T. Wiley, Enrique Chagoya and Lawrence Ferlinghetti, partnered with 90 San Francisco neighborhood businesses and venues, and managed hundreds of community volunteers. WHEN: Passport Stamping Day: Sunday, October 23, noon – 4 p.m. Located in the heart of San Francisco’s Civic Center, the San Francisco Arts Commission Galleries makes contemporary art accessible to broad audiences through curated exhibitions that both reflect our regional diversity and position Bay Area visual art production within an international contemporary art landscape. By commissioning new works, collaborating with arts and community organizations and supporting artist’s projects, the SFAC Galleries’ programs provide new and challenging opportunities for contemporary art to engage with a civic dialogue. The SFAC Galleries was founded in 1970 and is the exhibitions program of the San Francisco Arts Commission, the arts agency of the City and County of San Francisco. The Invest in Neighborhoods Initiative, one of the 17 points of Mayor Lee’s plan for jobs and economic opportunity, provides focused, customized assistance to meet the specific needs of San Francisco’s neighborhood commercial corridors. Invest in Neighborhoods aims to strengthen and revitalize neighborhood commercial districts around the City by marshaling and deploying resources from across multiple departments and nonprofit partners. These include economic development services such as loan programs, facade improvement grants, and technical assistance for small businesses. Invest in Neighborhoods is also leveraging other City services – from the Planning Department, Department of Public Works, Municipal Transportation Agency, and other departments – that help small businesses thrive, increase quality of life, improve physical conditions, and build community capacity. Every neighborhood commercial district has its own unique needs, opportunities and challenges. Invest in Neighborhoods aims to deploy the specific services and resources that are most needed in each district. 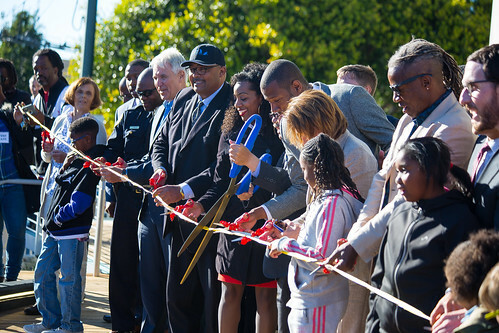 SAN FRANCISCO, CA – Today, Mayor Edwin M. Lee, joined by District 10 Supervisor Malia Cohen, City department heads, and members of the Bayview community, cut the ribbon on the newly renovated Bayview Opera House Ruth Williams Memorial Theater (BVOH). The celebration marked the end of an extensive renovation project that improved ADA access in and around the historic landmark and transformed the plaza adjacent to the building into a more inviting community gathering space for music and performing arts programs. See more images here. The $5.7 million renovation was led by the San Francisco Arts Commission, which owns the property, in collaboration with the Mayor’s Office on Disability, San Francisco Public Works and the San Francisco Municipal Transportation Authority. Renowned landscape architect and artist Walter Hood of Hood Design in partnership with TEF Design/Knapp Architects, Joint Venture oversaw the redesign of the plaza, which improves the streetscape of the entire intersection at Third and Newcomb. The plaza expands the cultural center’s programming potential with a newly designed wood stage and permanent seating surrounded by sustainable landscaping, including a grassy area that was created especially for children’s activities and larger community-wide events. The architects worked closely with the Mayor’s Office on Disability to develop a design that was sensitive to the historic character of the building, while making much needed upgrades for accessibility and functionality. The exterior entry staircase was enlarged and connected with elevated walkways to the side porch and back stage, creating a more operational and seamlessly accessible facility that improves circulation throughout the compound. Interior improvements include three fully accessible ADA restrooms and seismic stabilization of the historic balcony. Extensive dry-rot mitigation, resulted in an entirely new south facing wall, which is located behind the outdoor stage. Deborah Frieden & Associates provided valuable consultation to ensure that the project captured the community’s priorities, served its primary purpose as an arts center and maintained the historic features of the building while meeting 21st-century needs. Additional project support was provided by: OneSF, San Francisco Public Utilities Commission, Mayor’s Office of Housing and Community Development, the Community Challenge Grant program, Office of Community Investment and Infrastructure and Office of Economic and Workforce Development. This project also was made possible by the generous support of The Kaiser Permanente and the John & Marcia Goldman Foundation. “We are excited to welcome the community back into the Bayview Opera House for the fall grand reopening. We can’t wait to activate the incredible new space with live performances and to see it continue to flourish as the neighborhood cultural hub,” stated Theo Ellington, BVOH Board Vice President. Walter Hood, an artist, designer, and educator, is the Creative Director and Founder of Hood Design Studio in Oakland, CA. He is also a professor at the University of California, Berkeley and lectures on professional and theoretical projects nationally and internationally. Hood Design Studio, founded in 1992, engages landscape, urban site design and planning, art installations and research, unveiling the emergent beauty, strangeness, subjectivity, and idiosyncrasies of place. Walter and his work have been featured in publications including Dwell, The Wall Street Journal, The New York Times, Fast Company, Architectural Digest, and Landscape Architecture Magazine. Walter Hood’s own writings include his monographs “Urban Diaries” and “Blues & Jazz Landscape Improvisations,” which won an ASLA Research Award in 1996. Other writings appeared in the Princeton Press, “Diversity and Design,” Routledge, “The Mesh Book,” MIT Press, “Nordic Architecture and Landscape,” Archipress and “Climates: Architecture and the Planetary Imaginary,” Columbia Books. The San Francisco Arts Commission (SFAC), the $24 million City agency that champions the arts as essential to daily life by investing in a vibrant arts sector, enlivening the urban environment and shaping innovative cultural policy. Established by San Francisco’s City Charter in 1932, the SFAC is charged with overseeing the design quality of all new public infrastructure, stewarding the Cultural Equity and Cultural Center Endowments (totaling over $6 million in annual grant investments) and implementing San Francisco’s ‘2% for Art’ public art ordinance. Additionally, the SFAC manages San Francisco’s street artist licensing program as well as oversees the capital management of four city-owned cultural centers, three public exhibition spaces and San Francisco’s Civic Art Collection, which includes over 3,500 objects worth an estimated $90 million. Built by the Masons in 1888, the BVOH, is the oldest standing theater in San Francisco and survived both the earthquake and fire in 1906. It is the first and so far only building in San Francisco’s District 10 to be included in the National Register of Historic Places. Run by the non-profit, Bayview Opera House, Inc., the facility is dedicated to providing arts education for at-risk youth year-round for free or at a low cost. The organization also presents many cultural events throughout the year for all ages, including art exhibits, concerts, plays and community celebrations, as well as the recently established 3rd on Third event. San Francisco, CA—Mayor Edwin M. Lee with the San Francisco Arts Commission and Recreation & Parks Department today announce that San Francisco’s Civic Center Plaza will host Intrude, a large-scale public artwork by artist Amanda Parer. The public artwork will activate the public space and be available to all of San Francisco residents and visitors to enjoy 24 hours, 7 days a week beginning April 4th through April 25th. The highly acclaimed installation features five monumental nylon rabbits that are inflated to 23 feet high and internally lit at night. The presentation of Intrude was a collaborative effort between the San Francisco Arts Commission, which runs one of the oldest and most respected public art programs in the country, the Recreation & Park Department and the Office of Economic and Workforce Development. Over the years, Civic Center Plaza has hosted a number of popular public art installations that have bolstered public interest and quality of life, use of the public space, and enhanced economic activity in and around the area in San Francisco’s unique neighborhoods. Additional support for Intrude was provided by MJM Management and Another Planet Entertainment. The City’s Civic Center is the next stop on the North American tour of Intrude, which has brought a joyful spirit to more than 19 major cities throughout the world, including London, Paris and Boston. “I am thrilled for the bunnies to make their way across North America. I expect people will be drawn to the rabbits’ playful appearance, and I hope they will also take the time to understand the deeper meaning in the work and discuss how our actions impact the natural world in which we all live,” says Parer. A civic dedication ceremony will take place on Tuesday, April 5 at 9 a.m. on the Polk Street steps of City Hall across from Civic Center Plaza. Off the Grid is a partner for Intrude and will provide food trucks and music programming in the evening of April 5th and a small selection of food trucks for lunch and dinner for the entire duration of the exhibit. Amanda Parer’s edgy and ephemeral artworks explore the natural world, its fragility and our role within it. Her work features startlingly beautiful creatures enlarged and frozen within their chosen habitats. When viewing one of these iconic, mostly feral animals inhabiting a beautifully haunting landscape, the environmental message is enhanced by the artist’s finely crafted traditional technique in any of her chosen mediums, such as painting, sculpture and public installation. Originally from Sydney, Parer now resides in Tasmania where her work has been acquired by both public and private collections. She has been selected for notable national competitions including five times for the Blake Prize, as well as for the Glover Prize in 2008, 2012 & 2013. Parer has just completed a new light art installation called Fantastic Planet which was commissioned by Winter Lights Festival in London. Parer is currently developing a full exhibition at Harbour City Gallery in Hong Kong, which will open in October 2016 and include paintings, sculptures, and installation. She has also been commissioned to create a new public artwork for the inaugural Doha Festival in Qatar. Intrude has also been invited to be presented at the opening of the La Boverie, a new tourist attraction in Belgium that is both a fine arts museum and an international quality exhibition center. Intrude at La Boverie will be produced in collaboration with The Louvre Museum in Paris. For more information, go to: amandaparer.com.au. SAN FRANCISCO – February 8, 2016 – Members of Americans for the Arts, the leading organization for advancing the arts and arts education in America, have elected Director of Cultural Affairs Tom DeCaigny as a member of their executive committee for the United States Urban Arts Federation (USUAF). DeCaigny will advise Americans for the Arts’ staff on developing programs and services that will build a deeper connection to the field and the network membership. Americans for the Arts’ USUAF is an alliance of the chief executives of local arts agencies in the nation’s 60 largest cities. These leaders advocate, network, and meet to discuss the social, educational, and economic impact of the arts in their regions. As the Director of Cultural Affairs for the City and County of San Francisco DeCaigny leads the San Francisco Arts Commission (SFAC), the $24 million City agency that champions the arts as essential to daily life by investing in a vibrant arts sector, enlivening the urban environment and shaping innovative cultural policy. Established by San Francisco’s City Charter in 1932, the SFAC is charged with overseeing the design quality of all new public infrastructure, stewarding the Cultural Equity and Cultural Center Endowments (totaling over $6 million in annual grant investments) and implementing San Francisco’s ‘2% for Art’ public art ordinance. Additionally, the SFAC manages San Francisco’s street artist licensing program as well as oversees the capital management of four city-owned cultural centers, three public exhibition spaces and San Francisco’s Civic Art Collection, which includes over 3,500 objects worth an estimated $90 million. Potential council members were nominated in mid-September and were voted on by members of Americans for the Arts through November 12, 2015. DeCaigny will serve a three-year term ending on December 31, 2018. San Francisco, CA—Mayor Edwin M. Lee today announced Armistead Maupin, local icon and acclaimed author of the Tales of the City series, has been named to receive the 2016 Mayor’s Art Award. Mr. Maupin will receive the 2016 Mayor’s Art Award on Tuesday, March 29 at a fundraising reception hosted by ArtCare: Friends of the San Francisco Arts Commission. Armistead Maupin was born in Washington, D.C., in 1944 and grew up in Raleigh, North Carolina. A graduate of the University of North Carolina, he served as a naval officer in the Mediterranean and with the River Patrol Force in Vietnam. Maupin worked as a reporter for a newspaper in Charleston, South Carolina, before being assigned to the San Francisco bureau of the Associated Press in 1971. In 1976 he launched his groundbreaking “Tales of the City” serial in the San Francisco Chronicle.